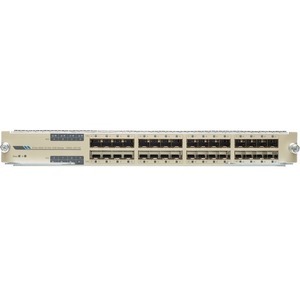 The Cisco Catalyst ® 6800 Family Switches offer a variety of 10-Gigabit Ethernet modules. Working in conjunction with the Catalyst ® 6500-E/6807-XL Supervisor Engine 2T/2TXL (VS-S2T-10G & VS-S2T-10GXL), they can serve different needs on campus deployments. The family includes three modules: the Catalyst 6800 32-port, 16-port, and 8-port 10-Gigabit Ethernet Fiber Modules. The modules support hardware-based multicast replication, quality of service (QoS), access control lists (ACLs), jumbo frames, and low latency to enable secure and predictable performance for bandwidth-intensive applications. All three share a common ASIC architecture and support the same set of features in hardware. They support Small Form-Factor Pluggable (SFP/SFP+), 10/100/1000M GLC-T (1G copper SFP) transceivers, and 100M FX. The modules are designed to meet the increasing demand for aggregation of 10-Gigabit Ethernet streams in campus deployments, as well as for high-density 10-Gigabit Ethernet transport in the core. The modules consist of port groups of eight ports each. The 32-port and 16-port modules can operate in either of two modes: 1) oversubscribed mode (default), which provides for maximum port density, using all of the ports with 2:1 oversubscription; and 2) performance mode, which uses half of the ports, enabling line rates and double the port buffer size. The mode of operation can be changed for each eight-port port-group (mixed mode), and is described in more detail in the following sections. The eight-port 10-Gigabit Ethernet Module always operates in performance mode.